Wild Ride Brew crew cranking out craft beers in new Redmond hotspot. Get ready for a fresh addition to Central Oregon’s effervescent craft brewing scene with the emergence of Wild Ride Brewing, which has started with a bang in Redmond offering more than ten in-house beers in a newly iconic location downtown. 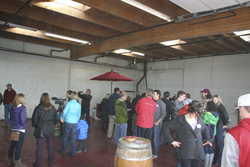 The ownership group, primarily comprised of long-time local residents, has spent the last year overseeing the transformation of an 8,700 square foot former Parr Lumber warehouse on Fifth Street into a vibrant new production brewery and tasting room – complete with outdoor patio and custom-fabricated fire pits – which opened to a rapturous reception earlier this month. In a new twist for Redmond, eating choices will be available via food trailers stationed on the property lot, which patrons can enjoy outside or in the 1,000 square feet tap room, where growlers can also be filled or brewery apparel purchased. Wild Ride joins Cascade Lakes Brewing Company, Smith Rock Brewing and Juniper Brewing as part of Redmond’s growing craft beer fold, and co-owner Brian Mitchell said: “The concept is pretty simple; we are not a restaurant and our focus is on beer production including a tasting room, where we really wanted to create an inviting family-friendly environment, and we can have upwards of four food carts to cater to our customers. The initial idea came about some two-and-a-half years ago through exploratory conversations between a group of childhood friends that evolved into working on funding logistics, market research, business planning, building budgets and looking for a suitable facility to house the venture. Mitchell said connecting with Redmond Economic Development Inc. (REDI) Manager Jon Stark was a key step in the process, as he helped link the group with advisory resources and the potential viability of the Parr property. Kevin Link, senior project manager for SunWest Builders, which joined the team as general contractor, said one of the challenges with conversion of the site included there being no gas, water or sewer connection to the building, as well as an outdated electrical system. Link said: “We worked with the City and utility companies to bring appropriate capacity, while also allowing for future growth and taking steps like mitigating waste output, including installing a pretreatment wastewater system as a proactive measure. Ascent Architecture worked on the design component including the distinctive red and metal screen motif on the exterior to deliver a cool, contemporary look, while inside the modern and traditional marry with fir timber features sprinkled throughout, and reclaimed barn wood also utilized in the façade fronting the rest rooms – which are actually housed in the brewery production space. Large glass-paned roll-up garage-style doors at the entrance and between the tasting room and brewery boost the airy open feel to the premises as part of a thrust to enable visitors to feel immersed in the production process. Ascent Principal Architect Seth Anderson said: “As a block structure, the building was somewhat adaptable and within the design framework we worked on assembling the components, including adding window space via the roll-up glass doors, to deliver a sensory experience of being involved in the craft process. Mitchell said the partners came up with the Wild Ride name partly to symbolize the passion they bring to their business as well as paying tribute to the gusto of Central Oregon residents in enjoying the region’s renowned outdoor and recreational activity opportunities. “In the early stages we studied a number of business models and what other exponents were doing well, but we also wanted to have our own unique niche. Mitchell said a key component in the business formula was the bringing on board of Brewmaster Paul Bergeman, whose track record includes stints with Laurelwood Brewing in Portland and Hawaii’s Kona Brewing. Bergeman said: “I was looking to get involved with a new brewery from the ground up, and also for ownership opportunities and a great environment for my growing family, so this was an ideal and natural fit. Illustrating Bergeman’s viewpoint, a grain silo sits to the exterior of the production area, then the line continues through the interior, following the process from raw materials at one end through steps such as fermentation and conditioning tanks to the finished product at the other end, with keg storage and ample walk-in cooler storage space rounding off the equation. There is also an area devoted to cultivating barrel-aged beers. With an eye to the future, the 20-barrel production brewery, with three 40-barrel fermenting tanks, also offers ample opportunity for further expansion, potentially via distribution across the state and beyond, while further developments are set to include bottling and canning. But for right now, the concentration is on serving the local market with an eclectic array of new draft product on tap, and Wild Ride has come out of the gates strongly with some eleven in-house brews, including Hopperhead IPA, Cole’s Trickle Lager, “Big Booty Golden Ale and 3 Sisters Red Ale, to name but a few. And judging by the thronging opening day crowds, both the beers and eclectic ambience have been enthusiastically welcomed by the local community. Bergeman added: “We are looking to come up with a variety of different brews and styles for the Central Oregon market. I am thrilled with how things are turning out already and we are looking at improving all the time. Stark explained: “As a new manufacturing facility, the company qualified for Enterprise Zone assistance, including tax abatements on new equipment. “We were also able to help with site location, and it is great to see a vacant older building in the central core be re-purposed like this as part of the continuing development of the downtown character. Developer: Wild Ride Brewing, LLC. Structural Engineer: Froelich Engineers, Inc.
Civil Engineer: Hickman, Williams & Assoc. TCS Contracts Inc., B.C. Mechanical, Collins and Sons, We Cut Concrete, Jason Urbach Construction Co., Daley Construction, All Position Welding, DO Insulation, ACC Spray Insulation, River Roofing, Commercial Door & HW, Performance Building Products, JL Drywall, Cascade Painting, John Varner Construction, North Country Building Specialties, Professional Heating Cooling, Lee Ramsey Plumbing, Elite Electric, Metal Art Welding.